human skin and the lymph nodes into our body. These parasites then move around to the lymphatic vessels wherein they develop into big worm and thus lymphatic channels drain excess fluid from our body and plays important role in the infection-fighting immune function. Elephantiasis is painful and strongly visible later in life. The acute episodes of the disease cause temporary disability, whereas lymphatic filariasis leads to permanent disability. Thus the prevalence and intensity of infection are linked to poverty in most of the South East Asian (SEA) region and little percentage in remote tropical areas. Nine out of eleven countries in SEA region is known to have endemic filariasis. Causes : Lymphatic Filariasis mainly caused by infection called Nematodes (Small Larvae), which is the family of Filariodidea. The life cycle of worm is very complex, these worms multiplies and producing millions of Microfilariae. 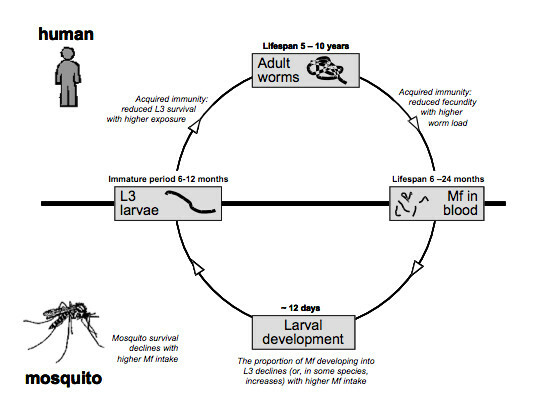 Only female worms produces Microfilaria that circulate in bloodstream and these Filarial worms lives in our body for 6 to 8 years, wherein it disrupts the entire lymphatic vessel and thereby affecting immune defense system, If the infected person is bitten by a mosquito, and those mosquitoes will carry the filariae to another host, continuing the cycle of infection and thus the larvae enter the lymphatic system and develops into adult worms over a period of time, causing Elephantiasis. Lymphatic Filariasis is lodged into our body through mosquitoes, which are mainly Culex Mosquitoes; these mosquitoes are wildly seen across urban and semi-urban area. 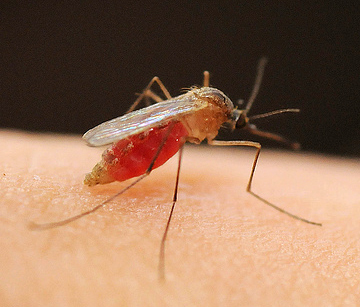 Anopheles mosquitoes are mainly observed in rural areas. Aedes Mosquitoes are observed mainly in endemic island of Pacific region. By the time people develop Elephantiasis, most of them no longer have active Filariae remain in their body. This is due to accumulation of lymph fluid into our body, which impacts the ability to fight against infection, by leaving affected people more prone to germs and bacteria. Treatment : Treatment of Elephantiasis purely depends on condition, the condition is whether, and the infection is under active stage or resulted in complication. If the infection is in active stage, the suggested method of treatment is Diethylcarbamazine citrate (DEC) (6 mg/kg) medicine. These medicines clear Microfilariae from blood vessels, which destroys the adult worms and thus stops the cycle of parasites. Single dose of two medicines are given together which is Albendazole-400mg plus Invermecin-150-200mcg/kg in the area where Onchocerciasis is also prevalent. If infection is reached to complicated stage it cannot be treated with DEC. The DEC drug kills only active Microfilariae. Patients with such disease have to undergo exercise as prescribed by therapist, as well as certain health tips and hygiene measures are given to prevent further infection spreading around. Most of the times Hydrocele is treated by surgery, surgery are undertaken to relieve the swelling of Scrotum. Controlling of Mosquitoes is another measure to suppress transmission of infection to people. Most commonly used measure is insecticide spray or indoor nets to reduce the spreading of infection populations. All these above measures may help to protection population in endemic regions from such infections.As a result, health tips and hygiene measures are given to patient for prevention of Lymphatic Filariasis or elephantiasis.